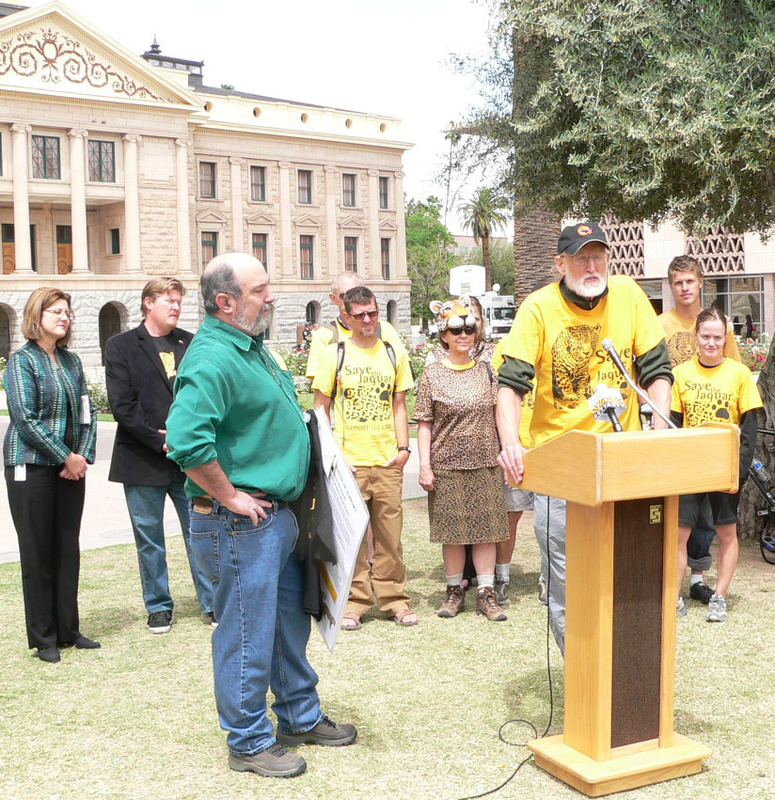 Citizen Statement of Support for Jaguar Recovery presented to Mr. Steve Spangle of the US Fish & Wildlife Service by Dr. Tony Povilitis (at podium) and cyclists, with State Representatives Daniel Patterson and Nancy Young Wright looking on. Starting line up at Pena Blanca Lake on the Coronado National Forest near Nogales, AZ, April 15, 2010. Left to right: Diane Flannery, Gary Flannery, Eric Holle, Tony Povilitis, Turtle Southern, D.J. Trebec, Dusti Becker, Heather Batts, Craig Miller, Casey Wollschlaeger, Julie Miller. 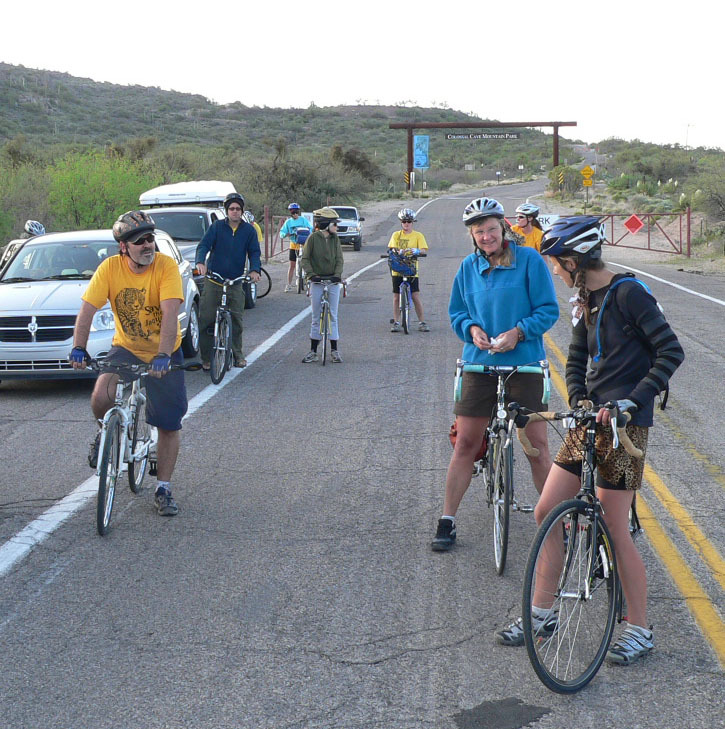 JBATERS leaving Collosal Cave Mountain Park on a cool morning, April 17, headed into Tucson. Sure wish I had a tree to climb! 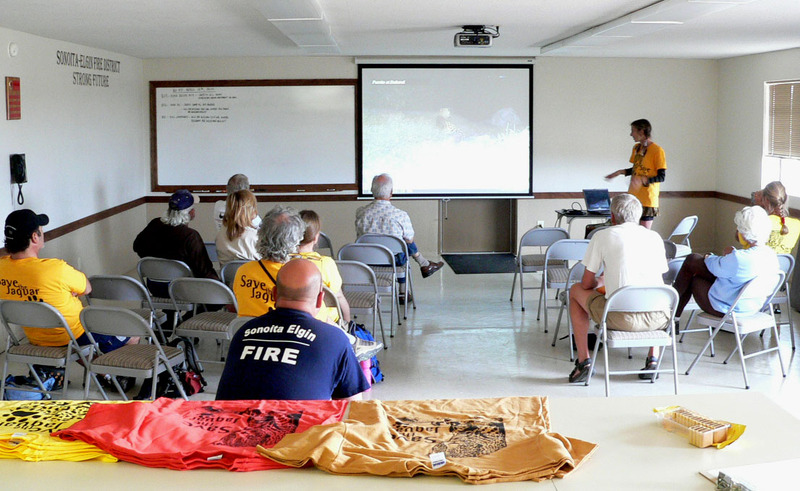 Turtle gives a jaguar talk at Sonoita Fire House, April 16. Whew! Made it...but what about the big I-10? 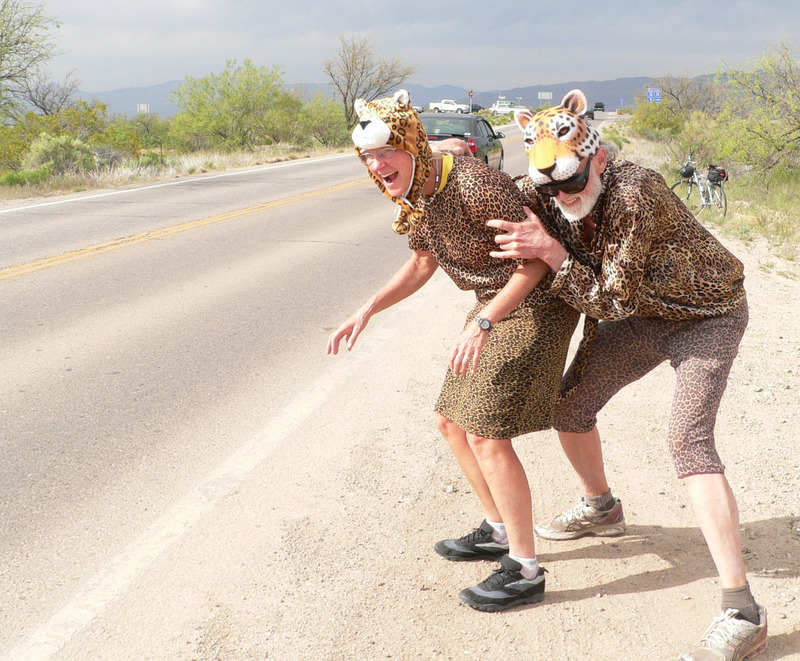 JABAT wins 1st place ("adults") in Tucson Parade, April 17, with help from "Big Jaguar," compliments of the Center for Biological Diversity. Team JBAT relaxes at Gary LaCroix's place in Mammoth. Rene Barbaree (red) hosts JBAT in Oracle. 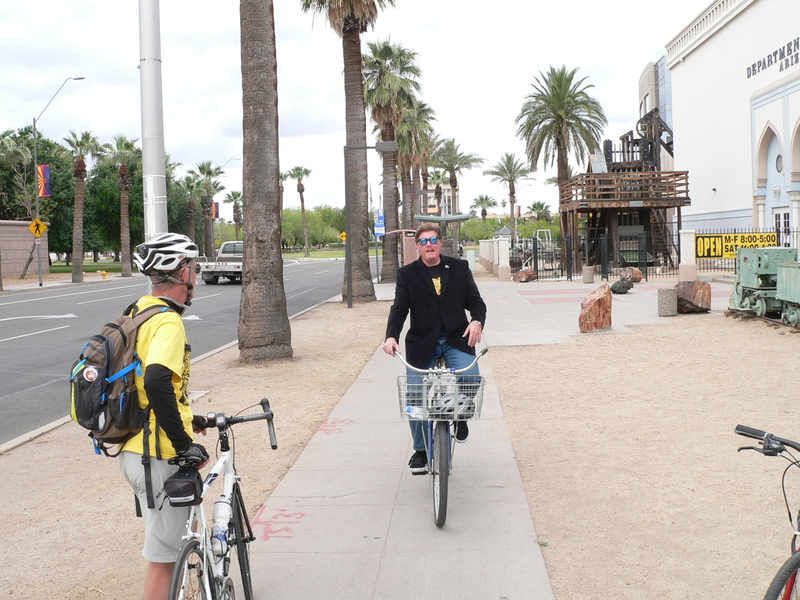 State Rep. Daniel Patterson joins cyclists in Phoenix. 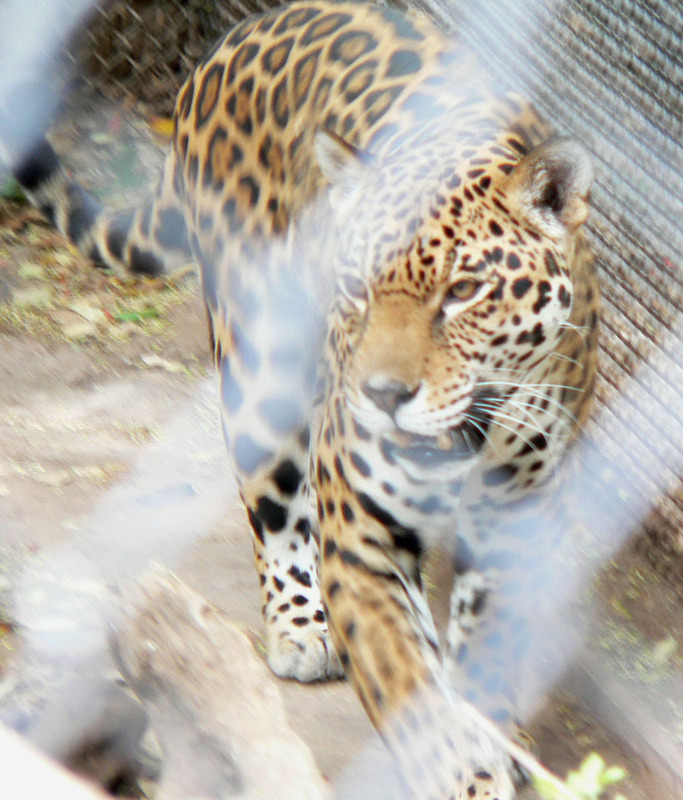 Wild habitat along JBAT route awaits jaguar's return. Heather Batts, Dusti Becker, Ian Fritz, Diane Flannery, Gary Flannery, Andrea Gaines, Eric Holle, Mike Ingrahm, Anna Knapp, Joyce Kolbrer, Craig Miller, Julie Miller, anonymous, Lee Mortimer, Pacific Sommers, Turtle Southern, Daniel Patterson, Tony Povilitis, J.D. Trebec. Renee Barbaree, Paul Hirt, Gary La Croix, Jennifer Parks, Natalie Robb, Tim Storer, Paul Wolterbeek. 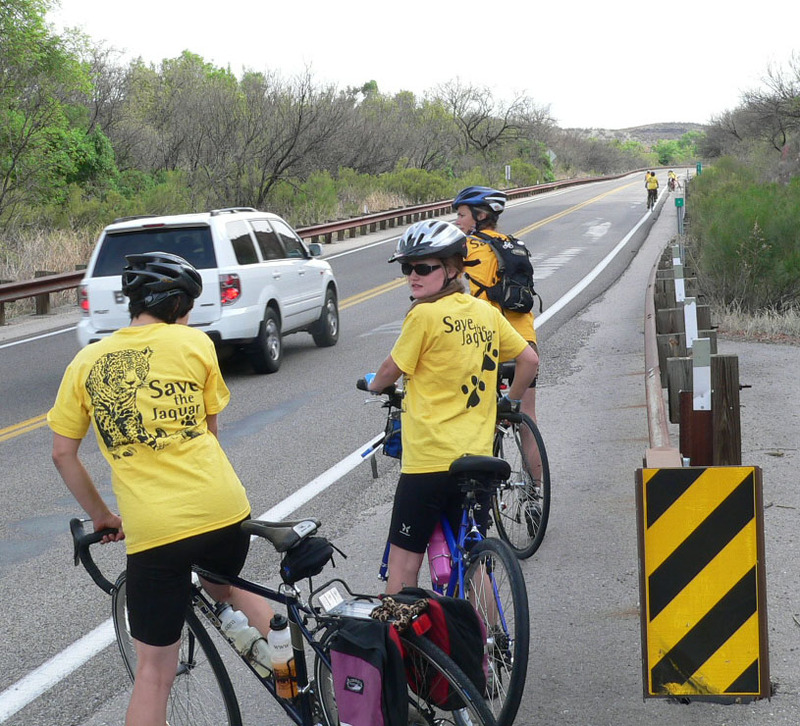 Join us for all or part of this 8-day 300 mile bike trip to support recovery of the jaguar as a native species of the USA. Not sure if you can ride? No problem, join us on the road. See our Day by Day Schedule. 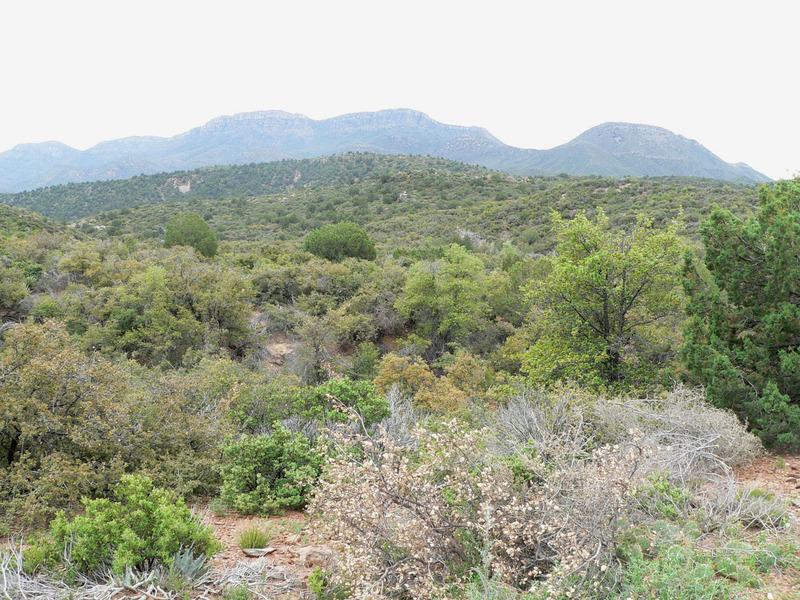 The trip begins in the beautiful mountains of southern Arizona and ends in Phoenix on EARTH DAY, April 22. We’ll pass through great country and the towns of Nogales, Patagonia, Sonoita, Tucson, Oracle, Mammoth, Globe, and Superior along the way. En route we’ll build support for jaguar conservation with evening presentations and other activities. 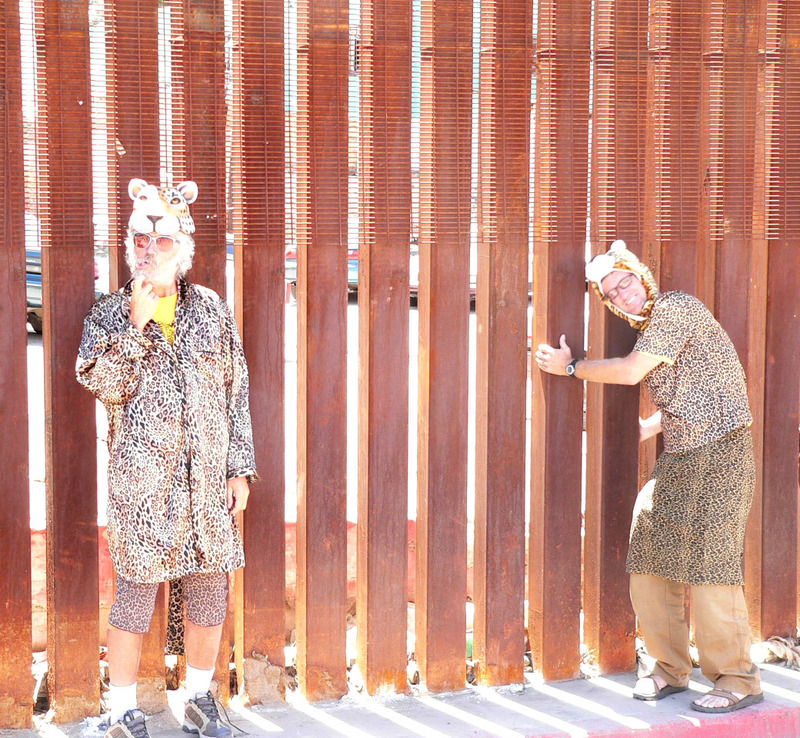 In Phoenix we will deliever the Citizens’ Statement of support for jaguar recovery, hold a rally, and enjoy a closing fiesta. Click here for a map of the general route. 2. You can help with media contacts, by driving a support vehicle, by getting endorsements for the Citizens’ Statement, or by offering art work, food, a cold drink, and a friendly smile. Or leave your message below. Indicate if you want to be a cyclist or a support person. Tony will get back to you and provide further details. Help circulate the JBAT flyer! 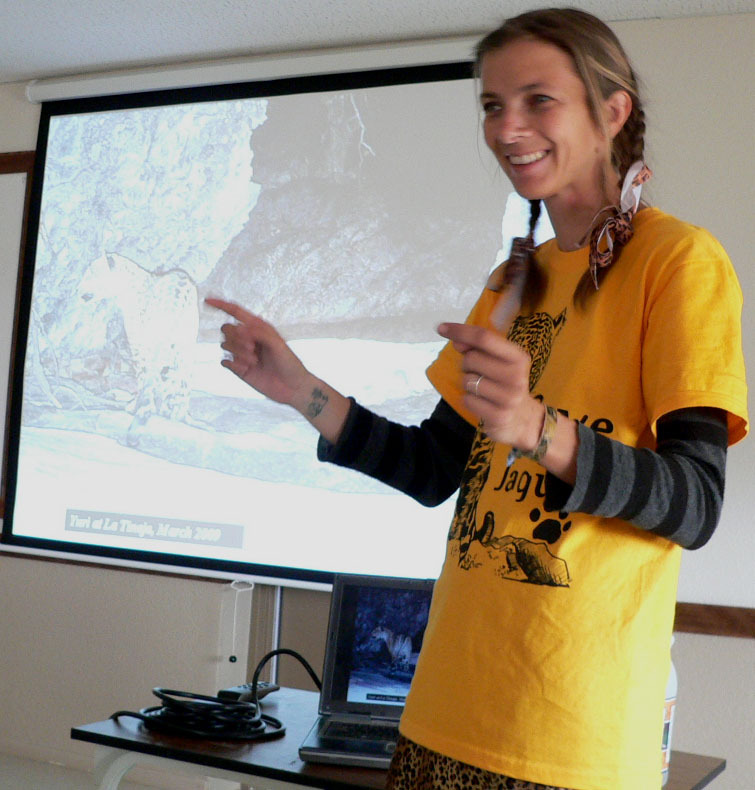 We extend our thanks to the Northern Jaguar Project and the Center for Biological Diversity for posting notice of the JBAT. Much appreciated! See NJP and CBD announcements. 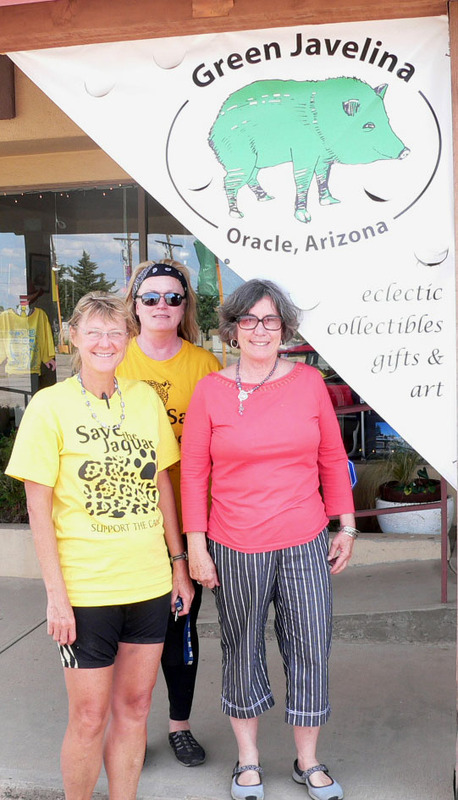 BAT for the Southwest Jaguar! 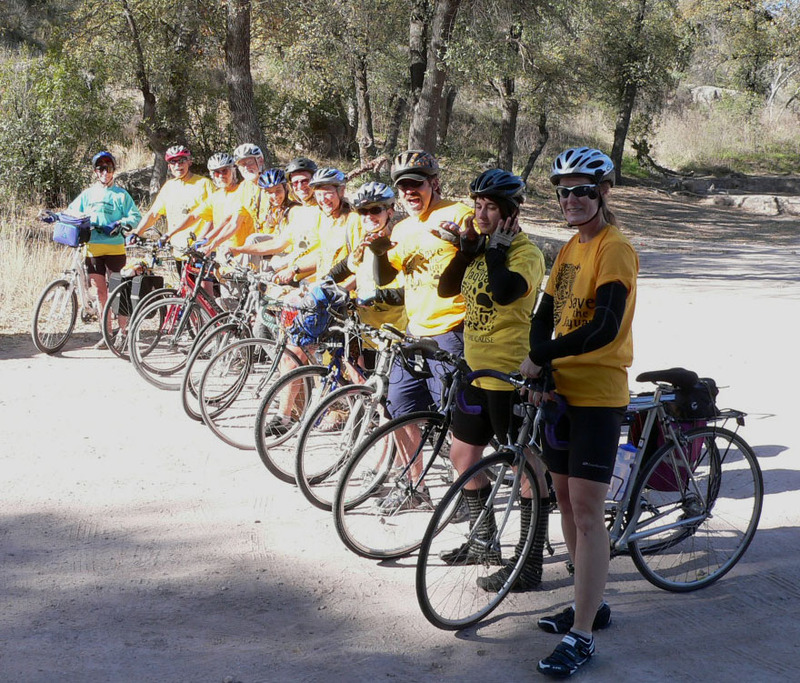 Hear ye, Hear ye…Calling cyclists and supporters for the upcoming Jaguar Bike-A-Thon in Arizona. 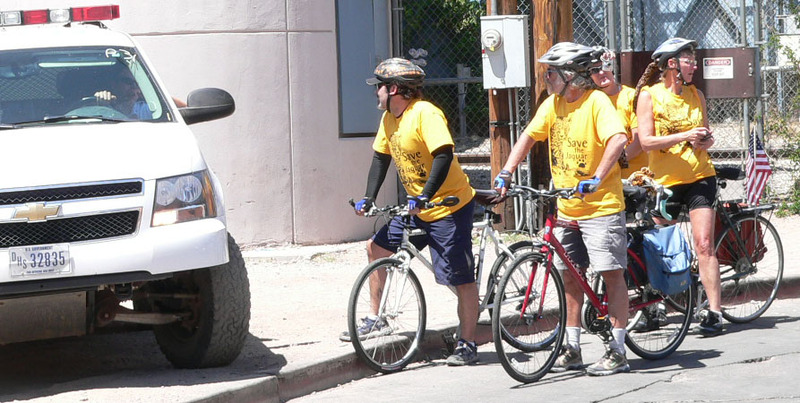 We will be going the “extra mile” for the jaguar – pedaling a route of over 300 miles from the Arizona-Mexico border to Phoenix, Arizona, to demonstrate our strong support for bringing back the jaguar as a native species of the American Southwest. We invite you to join us for all or part of this important event, or pledge your support and assistance (see check off below). When: Spring 2010. Exact dates to be decided. Please fill out our Jaguar BAT Questionnaire . Itinerary (Subject to change/modification): The US-Mexico Border at Sasabe; Arivaca; Coronado National Forest; Nogales area; Patagonia-Sonoita, Saguaro National Park; Tucson; Oracle; Superior; Phoenix. 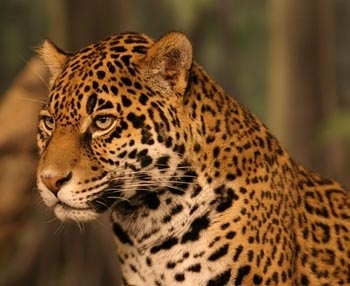 We will make short stops in or near areas of important jaguar habitat, places where jaguars were know to have occurred, and locations where there are threats to jaguar habitat. 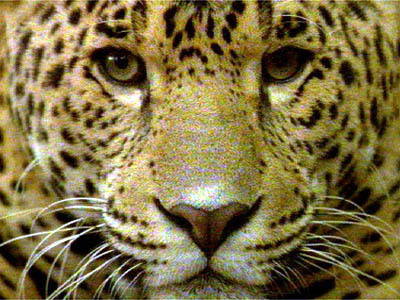 Objectives: Our purpose is to build public awareness and support for recovery of the endangered jaguar in the American Southwest. We will talk to people along our route and carry conservation messages from them along with proposals to restore the jaguar. We’ll present these to federal and state officials and elected leaders in Phoenix. ____Sign me up! 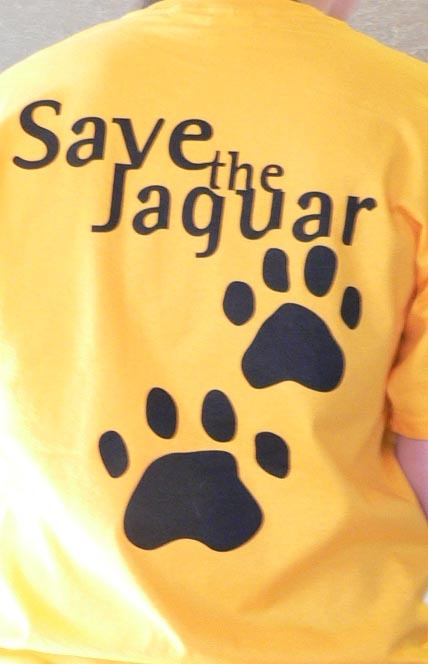 I will peddle to show my support for jaguar recovery during all or part of the event. 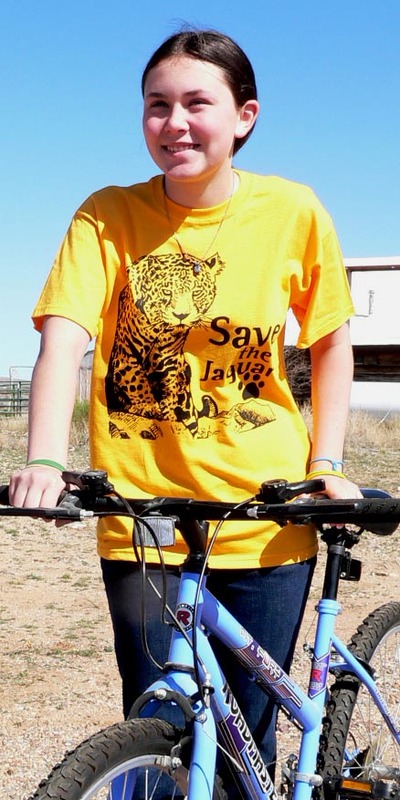 I will gladly help with costs for a jaguar T-shirt and other items to be worn or carried by our team while on the Jaguar Bike-A-Thon. You are currently browsing the archives for the Jaguar Bike-A-Thon category.